2019 Final Four Preview: Can Red-Hot Auburn Continue Its Historic Run? Riding a 12-game winning streak, Auburn's first-ever title is within reach after dethroning some of college basketball's kingpins. We'll be previewing the entire Final Four field in Morning Madness this week. Auburn, which has won 12 consecutive games, is making its first Final Four appearance in program history. Here's everything you need to know about the red-hot Tigers as they prepare for a bout with Virginia. By boldly running through college basketball royalty. After narrowly surviving New Mexico State in the tournament’s first round, Auburn put whoopings on Kansas and North Carolina, then battled back from a double-digit deficit against Kentucky to win in OT. The upset of the top-seeded Tar Heels was something of a national coming-out party for the Tigers, who in that game showcased their comfort playing at high speeds and confidence launching from deep distances, connecting on 17 three-pointers. In that game, they also lost starting forward Chuma Okeke to a torn left ACL, but were able to rally to upset Kentucky with their teammate watching from a wheelchair behind the bench. The Tigers are not daunted by anything. Higher seeds? Prestigious programs? A horde of NBA-bound talent? A team that beat them by 27 five weeks ago? Needing to reinvent themselves without a versatile burgeoning star? Auburn has stared down all of those things in the last two weeks and not flinched yet, continuing to play with infectious confidence derived in part from, of all things, its underdog mentality. Also, the Tigers are going to keep shooting threes no matter the score and whether they’re falling or not, so they can mount comebacks and build leads in a hurry. Auburn speeds up Virginia past the Cavaliers’ comfort level and the Tigers’ range and ability to put four shooters on the floor get them to Monday night, where the shots keep falling on the biggest stage. They may be the lowest seed in this Final Four, but in March alone they blew out a No. 1 (North Carolina) and No. 2 (Tennessee, in the SEC tournament final) while edging another No. 2 last Sunday. Their upset run could extend two more games. The country’s hottest team finally cools off and the absence of the multifaceted Okeke leaves them without a means of disrupting Virginia’s vaunted Pack-Line defense, sending Auburn home after the opening game of its first-ever Final Four. More traditional big Horace Spencer got the start in Okeke’s place against Kentucky, but it was forward Danjel Purifoy—a 38.5% three-point shooter this season—who saw the biggest bump in minutes. A lineup with Purifoy and Anfernee McLemore (33.3% from three) playing together at the four and five spots could help Auburn space the floor against the 'Hoos, but could also make it harder to match up with 6’11” Jack Salt on the other end. The 5’11” point guard is a capable shooter (37% from three) and strong playmaker (11 assists against North Carolina) that, with his 12 overtime points against Kentucky, has already shown his ability to take over a close game. One part of his game that he hasn’t shown this new, wider audience? His ability to absolutely throw it down. 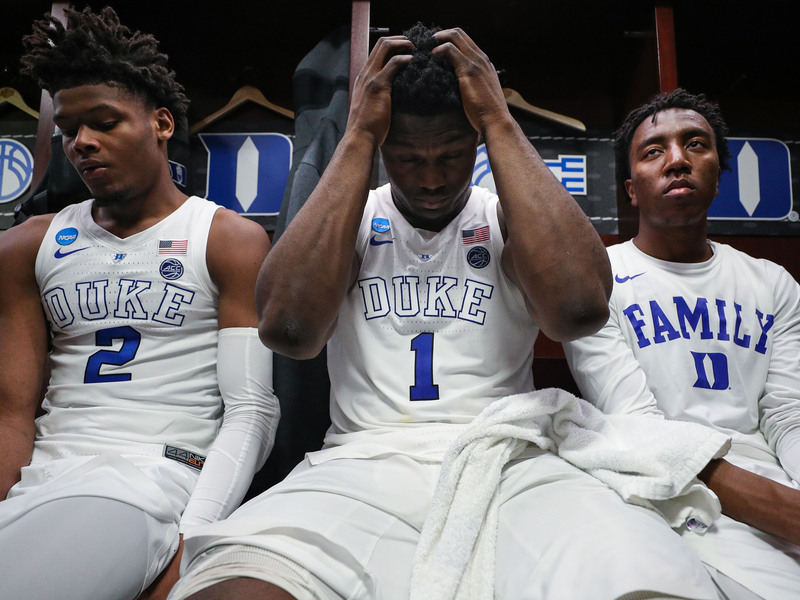 • Was Duke's season a failure since it fell short of the Final Four? A program will win the first national championship in its history for the first time since Florida did it in 2006. Yes, this is actually just a prediction that Michigan State won’t win, as the Spartans won titles in 1979 and 2000, and Virginia, Texas Tech and Auburn never have, so mathematically the odds are in favor of this. But hey, winning the big one for the first time in your first Final Four—which this will be for Tony Bennett, Chris Beard and Bruce Pearl—is never easy. After Auburn beat Kentucky on Sunday, Okeke did the honors of placing the team’s decal on the final space on the NCAA’s commemorative bracket. Because his teammates were standing in a circle around him (and because Okeke was sitting in his wheelchair), I didn’t actually see him do it, so afterward I asked Purifoy what it was like to witness. “He slapped it on there with a smile—the hardest I’ve ever seen him smile,” Purifoy told me. “Chuma’s a real quiet kid. We’re glad he can be happy in a situation like this.” What stood out was how Purifoy told me this as his mouth widened into a smile of its own, one that seemed like it might stretch beyond the boundaries of his face. In a locker room full of celebration, his pure joy about his injured teammate’s moment of happiness was the expression that stuck with me most.